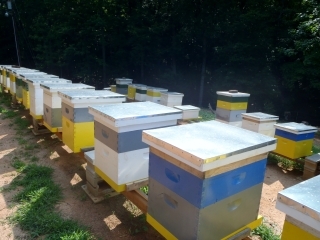 Bill has added 24 hives to his current 10-hive apiary with the goal of making enough income from honey sales to become a full-time beekeeper. As his age approaches 80, he expects he will no longer be able to continue driving a bus to make a living, a supplement to his modest military pension. Increasing his apiary has the potential of adding 2.4 million more pollinators to the area, Bill said. “Not only will I be building my own business but at the same time I will be making a significant contribution to agriculture by providing more pollinators,” he said. Bill has developed an efficient method for determining excessive mite loads and a quick inexpensive non-chemical treatment that is 90 to 95 percent effective. From each hive, Bill expects to harvest an average of 30 pounds of honey, which he sells at Marion Tailgate Market. He also expects to sell hive splits and queens to other beekeepers.